You can find a running demo here. If you want to specify a custom filter editor you can do it by using the EditorTemplateSelector property of the control. Once the editor (custom or default) is created, you can add the final touch to it by attaching to the EditorCreated event. Note that this approach can be used to create a custom editor of any kind! EditorTemplateRule - this class is used to associate a particular DataTemplate with a filtering member. EditorTemplateSelector - this class will represent the actual template selector. It should inherit the DataTemplateSelector class and override its SelectTemplate() method. It also should contain a collection of EditorTemplateRule objects. In the override for the SelectTemplate() method you should iterate the collection of EditorTemplateRule objects and return the DataTemplate appropriate for the currently created editor. 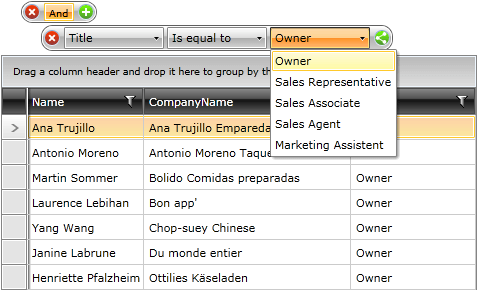 At the end of the topic you can find the code for the Employee business object used in this example and some sample data of this type. In XAML you have to create an instance of the selector, define its rules collection and set it to RadDataFilter. Also you have to attach an event handler for RadDataFilter's EditorCreated event. In it you can add your final touches to the editor. In this example this will be represented by populating RadComboBox with items. If you take a look at the defined rule, you can see that the Title property has been associated with the ComboBoxEditor template. This means that whenever the Title is selected as a filtering member RadComboBox editor will appear. In order to make the filtering possible, you have to bind the value property of the control that you are using to the Value property of the DataTemplate's DataContext by using a TwoWay binding mode. In this case this is the SelectedValue property. In order to set the case sensitivity, you have to bind the IsCaseSensitive property of the DateTemplate’s DataContext, also using a two-way binding. Here is the code behind of the example. The most important thing in it is the event handler for the EditorCreated event. In it you can fill RadComboBox editor with the desired data. As you can see by using the switch statement you can extend the logic for additional custom editors by adding more cases. Here is the code for the Employee object and the sample data.